Melt 8 oz. of the chocolate by cooking on low heat. Or, place chocolate in the top section of a double boiler or heatproof bowl set over a larger pan of simmering, but not boiling, water. (The bottom of the bowl should not touch the hot water.) Stir until chocolate is completely melted. Note: Do not get any water or steam in the melted chocolate or it will seize, become grainy and unusable. Beat cream cheese with mixer until creamy. Blend in the melted chocolate. Refrigerate 1 hour or until firm. When firm, shape into 36 balls and place on a waxed paper-covered rimmed baking sheet. Melt the remaining chocolate. 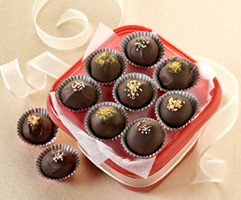 Use a skewer of fork to dip balls (truffles) in the melted chocolate; return the truffles to the prepared baking sheet. Top with crushed peanuts or sprinkles or other decorations as desired. Refrigerate 1 hour. 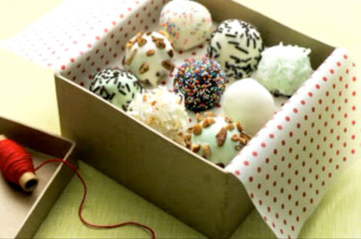 Decorate: Chocolate truffles can be dipped in a variety of coatings, including white chocolate or melted butterscotch morsels; and once dipped they can be rolled in things like powdered sugar, sweetened coconut, and pecans, walnuts and other varieties of nuts. Add flavor: to truffles by adding 1-2 tsp. of a favorite extract, such as peppermint, rum or almond; or ¼ c. of a favorite liqueur, such as orange or raspberry, to the chocolate mixture before shaping into balls. Store Truffles in tightly covered container in refrigerator. Makes 3 dozen.